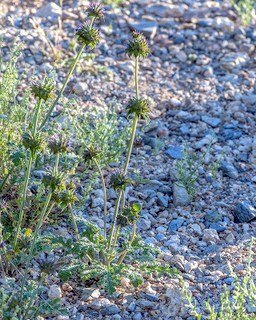 Did you know that Chia is growing in Sabino Canyon? Did you know that Chia is growing in Sabino Canyon? The botanical name for the Chia plant that is growing here is Salvia columbariae. It’s a very close relative of the Chia grown for its seed that is marketed commercially, Salvia hispanica. Both are members of the Lamiaceae or Mint family. Some other well-known members of this family are: Mint, Basil, Sage, Rosemary and Thyme. 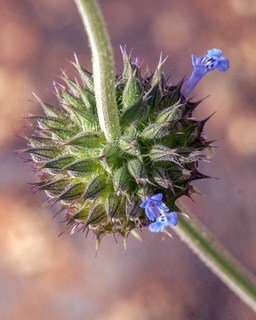 Other than themes for a song, most of the Lamiaceae are edible and on the tasty side. The most obvious characteristics of plants in the Lamiaceae family are square stems, opposite leaves, and crushed leaves are usually aromatic. There are non-mint family plants that may have some of the same characteristics, such as square stems and opposite leaves. Crush a leaf and smell it; if it’s aromatic it is most likely a Mint. Our Chia (Salvia columbariae) grows from 4-20 inches tall. Basal leaves are 1-4 inches long and have a textured, beady look. Stiff calyxes can feel spiny. The distinctive capitate verticils (head-like clusters of whorls) and blue flowers help to identify this annual plant. Also notice the stiff calyxes that can feel spiny. Bloom time is usually March-July. Look for it along any of the trail sides in lower Sabino Canyon. 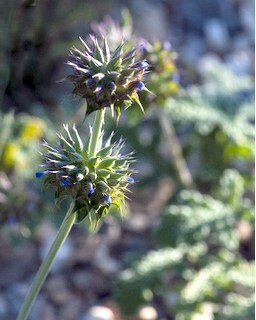 Ethnobotany/Medicinal: Poultice of seeds is used for infections, fevers, irritation and inflammation; the seeds are edible, and can be used to make a beverage, to render water palatable by removing alkaline, and are also used for pinole and mush to eat. Who uses Chia besides us? Chia provides nectar for several different butterflies, among them the Gray Hairstreak, Fiery Skipper, and Cabbage White. Hummingbirds visit Salvia species for the nectar. Bees are frequent visitors to Chia and most of the other Mint Family plants to gather pollen. Etymology: Salvia comes from Latin salveo, or “I am well,” while columbariae is a reference to Columbian, or of western North America.